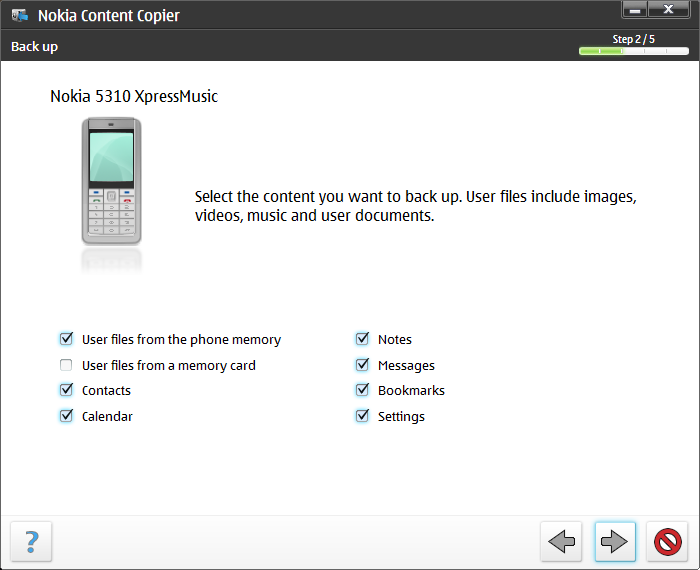 When you buy the Nokia 5310 Xpress Music you probably also get the CD included in the package. I know how we work with the packages. We unpack the main thing (the phone in this case) and put the package out of the eyes. We never read the manual a we never check the CD/DVD contents. But you shouldn't ignore it now. The Nokia PC Suite is very useful software. If you don't have an original CD included in the package together with your Nokia phone, you can still download it from the Nokia's web for free. Just point your browser to the www.nokia.com, select your region, click the Get support and software and Download software link. You should see the download link for the Nokia PC Suite software. Don't forget to select you phone (in my case Nokia 5310 XpressMusic) before you will start the download. This will select the appropriate version of the software for your Nokia phone. The installation of Nokia PC Suite is like an installation of any other windows software. Just click the Next button (with arrow symbol) whenever you are prompted. Before the installation is finished, you will be prompted to connect your phone to the PC. I prefer USB cable connection, so I connected the phone to my laptop and had wait for a while until the drivers were installed. The Nokia PC Suite is now ready to work with your phone. Just start it using the desktop shortcut or the Start menu. 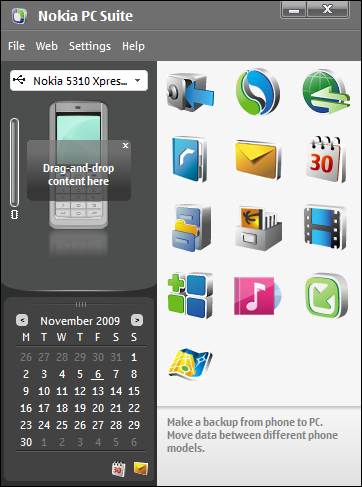 The Nokia PC Suite is a package of several applications. It starts as a small window with some shortcuts. For our backup purposes is important that the first button is dedicated to the backup or restore process. I highly recommend using this function as a first step when working with Nokia PC Suite. I again repeat. Any data, photo, files, events, contacts or messages loss points to a very sad situation. So do not underestimate this and backup as often as you can (or need). As you can see, the Nokia PC Suite is able to work with more than one phone you own. So I select my friend's new Nokia 5310 XpressMusic phone from the list on the top left. When you have your phone selected, click the first button the start the backup process. 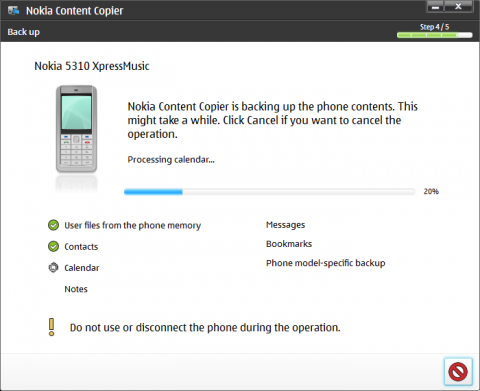 The Nokia Content Copier will start with Back up and restore features. 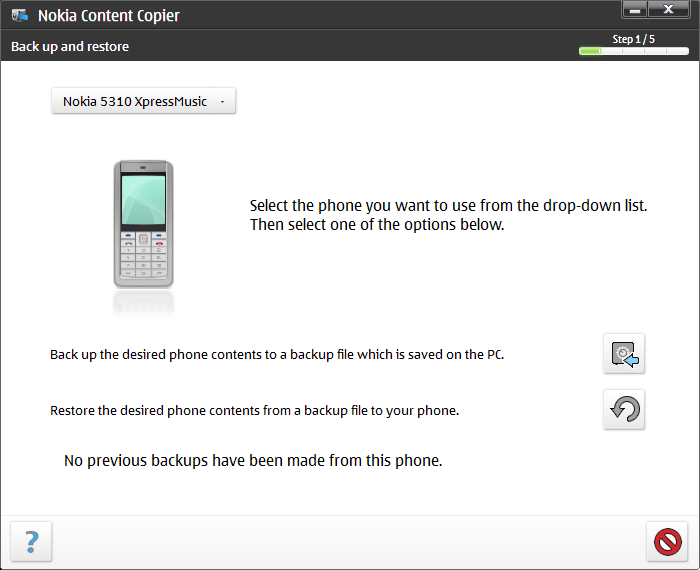 You can again select the right phone from the menu on the top (so I select the Nokia 5310 XpressMusic) and click the first button to start the backup process. 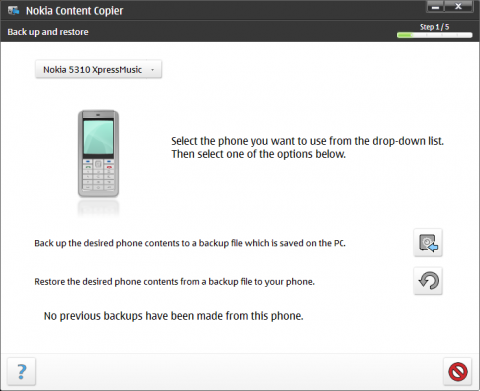 The backup wizard will read the content of your Nokia phone and then it will display what kind of data are you able to backup from your phone. In the case of Nokia 5310 XpressMusic there are all backup features available: user files from the memory or memory card (if you have one), contacts, calendar, notes, messages, bookmarks and settings. So select one, more or all the features (I recommend to select all) and click the Next button with an arrow. Select the folder for backup storage in the next step. The default backup location for your Nokia's data is not in your Documents. The backup is stored to the Application Data folder under your profile folder by default. The next step is all about the backup itself. Do not disconnect your Nokia phone during the operation and wait for a while until all your data are copied to the computer. Nokia PC Suite will inform you when it is done. Now you can click the green check button (Close) to return to the main PC Suite's window. As you can see the backup process for your Nokia 5310 XpressMusic or for any other Nokia phone is quite easy. The restore process could be done in a very similar way. Just click the Backup button from the main window and continue with a Restore button with the wizard. The Nokia PC Suite is available in many languages and localizations. Download your language version, the work will be easier. When you will connect your Nokia phone to the computer using the cable, you have to select the PC Suite option on your phone to make it work with Nokia PC Suite software. Many people forget this and think that the software doesn't support their phone. The backup button isn't the only function which stores your data from the phone to your computer. Whenever you start synchronizing the images, videos, contact and other components, you will get the same content in the phone and in the computer. The main differences between the synchronization of each items and the whole backup process is in the backup process speed and simplicity.